UN political chief says she is deeply concerned over the humanitarian crisis in Gaza, warns of war. 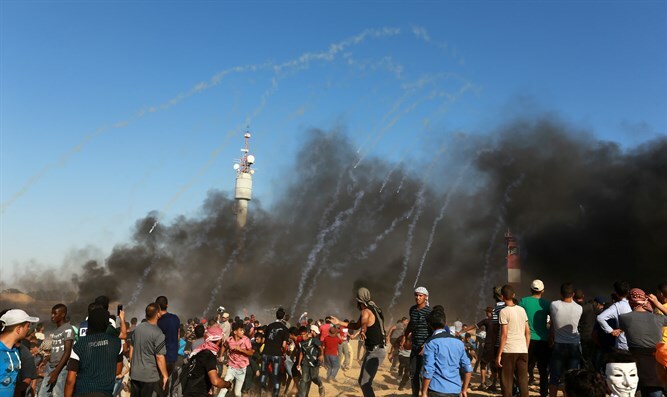 Tensions have risen in the region recent months, ever since Palestinian Arabs began the weekly “March of the Return” protests along the border between Gaza and Israel. In addition to attempting to infiltrate into Israel, the Arab rioters have been using kites and balloons with explosives attached in order to set fire to Israeli property. Earlier this month, Hamas terrorists fired over 150 rockets at Israel in one day. At least two Israeli civilians were injured by the rockets, one of them seriously. Dozens were treated for shock. Israel responded to the barrage of rockets by attacking Hamas military sites, including tunnels, training compounds, and weapons stores. UN envoy Nickolay Mladenov and Egyptian officials have been seeking to broker a truce between Israel and Hamas. Israeli media have speculated that a deal could entail easing Israel's naval blockade of Gaza in exchange for calm on the border and the return of the bodies of two soldiers killed in 2014. Di Carlo called "on all parties" to ensure that humanitarian aid reaches Gaza and urged Hamas to provide information on Israeli nationals held in Gaza.